Haven't had too much to report over the last couple of years... its done about 20 more events with no issues really. Some major changes soon to come on the mighty mirage. Not sure if its the smartest conversion but should be the coolest sounding and unique (Don't think anyone in the world has tried it anyway). 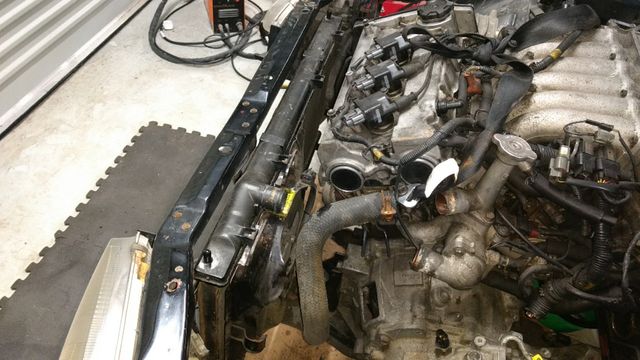 Ripped out the old engine and gearbox. 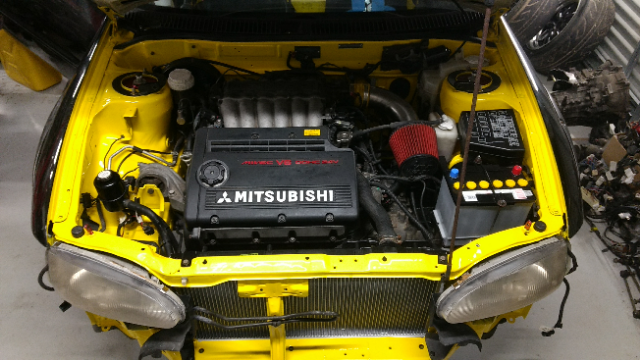 Will remove the ralliart mechanical LSD and install into our CJ4A mivec gearbox. Have fitted our original excedy japan clutch onto a CJ4A flywheel and test fitted everything to the 6A12 block. This all bolted straight up so should be a nice upgrade over the FTO gearbox which has less optimal gear spacing. 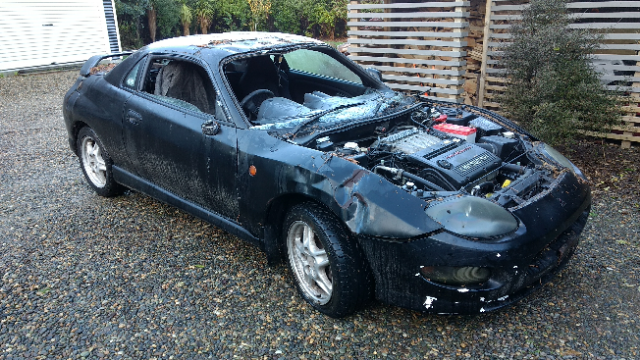 Next up is to strip the donor car and choose which subframe to modify to suit the engine turning around. Can then line up the engine and work out how to do the other 3 mounts. Hopefully the gearbox mount can be mounted easily with a few holes drilled through the chassis rail. Front mount can hopefully be the same but with some anchor nuts inside the radiator support. 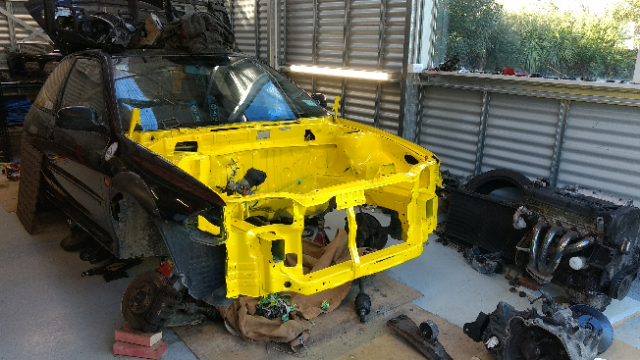 The drivers side will be the hardest i'm pickng but hopefully the donor cars mount can be unstitched and welded onto the mirage somehow. Starting to think its a bit optimistic with only 3 months until the season starts again... no pressure right! Been plugging away at the engine conversion when time permits which isn't much with work and children to look after etc. 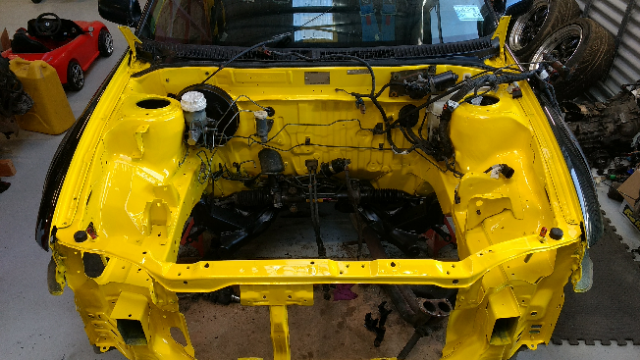 Most of the time was spent stripping the donor car and the mirage's old drivetrain so far. The actual engine install hasn't taken much time at all in comparison. 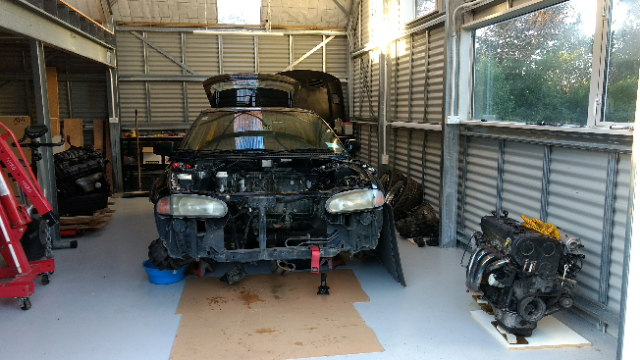 The FTO front subframe bolted straight in as i had hoped and the steering rack seems to have stayed in the factory position. 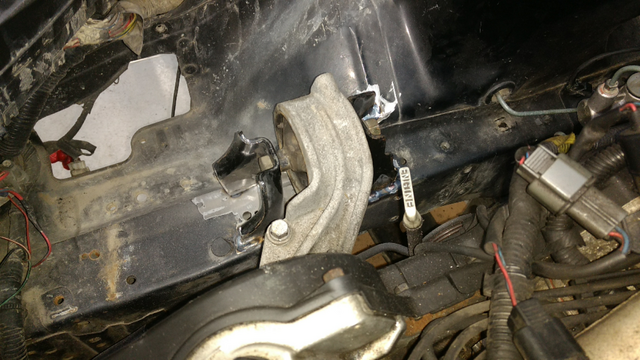 This allowed the installation of the north south beam at the rear and i carefully measured up the FTO front position from the centerline and held it with a tekscrew on the Mirage until i install crush tubes and anchor nuts on the lower radiator support panel. 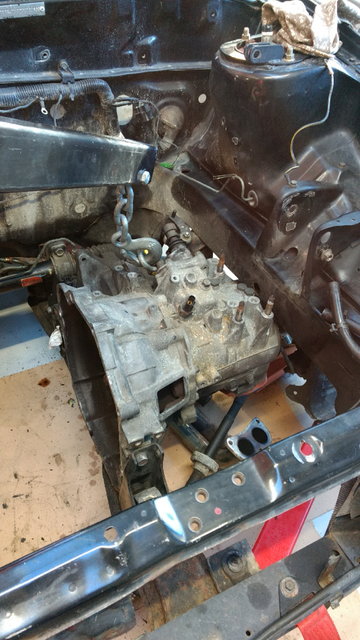 Mocked up the gearbox and worked out the amount of metal required to remove to allow clearance for the gearbox to the passengers chassis rail. After cutting out the chassis rail i could then mock up the gearbox and make up a mount. Figured it was a good idea to mount the box to the existing engine mount on the chassis rail. Means it can easily go back to 1600 at a later date if we wish. 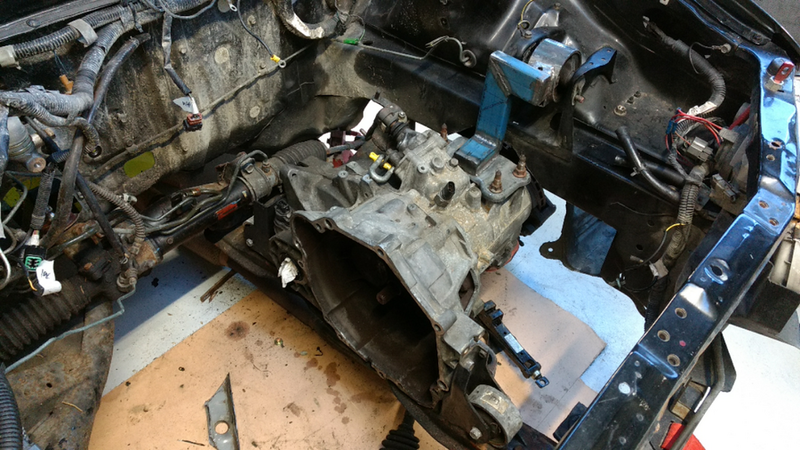 Cut the original FTO mount off the gearbox plate and just joined the 2 together with 50x25 box section. Next up was attaching the box to the engine and lifting it into the engine bay. Unlike a 4 cylinder the v6 is narrower so is quite easy to lift in from the top without hitting the chassis rails for anything. Fitted the new gearbox mount and lined up the north south beam. Then stuck a spirit level on the intake manifold to get the motor fairly level and made up the engine mount on drivers side. 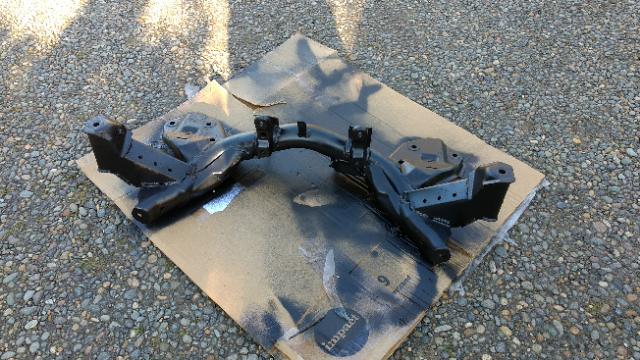 I ended up using some spare gearbox mounts by cutting them down and shaping them to fit the chassis rail and inner guard. 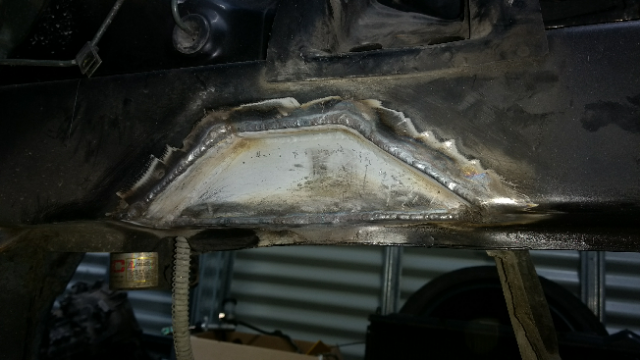 Tack welded them on for now until engine is removed again for full welding. Engine in the hole. Managed to get the FTO radiator to fit the Mirage with only a few tweaks to the mounts. The main fan was never going to fit as the engine would hit it however the aircon fan is thinner. Cut off the fans mounts and rewelded them on to line up with the radiator lugs and it now fits nicely. 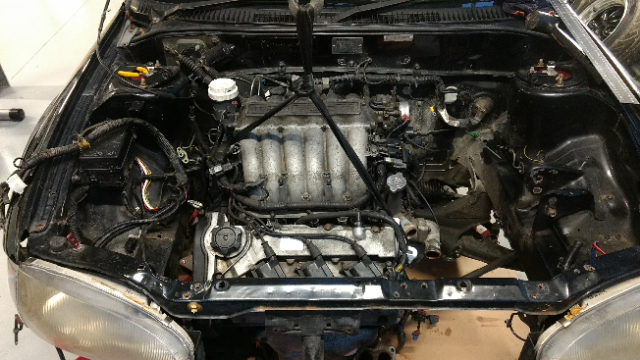 Next up is to remove the engine and box. Will weld on the drivers mount fully, box in the chassis rail i cut up and sort out the front mounting of the north south beam. Can then try sort out the brake booster and mastercyinder which needs relocating out of the way of the engine. While the engine was in i made up a little jig to simulate where the engine sits so can hopefully make it all clear without another trial fit. Did you weigh the motors? Haven't been able to weigh them as i only have glass bathroom scales... Need to think of another way. Hopefully not too bad, FTO's seem to handle very well and aren't much heavier than a mirage. You'd weigh them with those hanging scales and use your engine hoist I guess. I think the engine should be a fair bit heavier + being a V6 a lot of the weight has overhang forward of the wheels. A LOT of cocking around ensued trying to get the brake booster moved outwards. If i was to do this project again i'd fit a pedal box and ditch the booster. 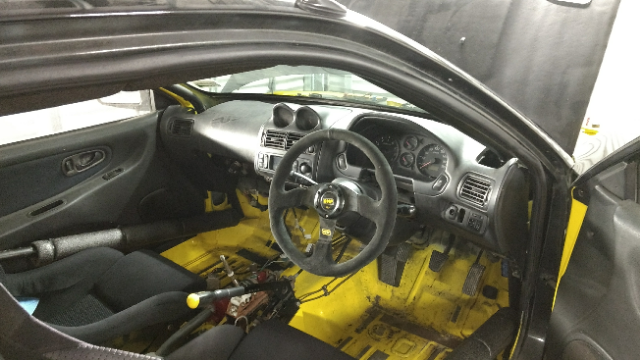 Ended up having to run the FTO accelerator and brake pedal assy and the original mirage clutch pedal to get the 3 pedals relatively straight. All 3 pedals are now about 50mm closer to the driver. Also had to relocate the window wiper motor to the passengers side but it was relatively easy to relocate using the FTO motor, also made wiring a breeze as FTO loom had a plug on that side anyway. Finally completed the metal work and slapped on a couple of coats of retina burning yellow. Wasn't my best work but was done in the middle of winter and sub 10 deg outside so not too bad all things considered. The FTO subframe has an evo 4 steering rack installed. This is only 2.3 turns lock to lock and with an extra 12mm of stroke means an extra 6mm of lock each way...hopefully this isn't too hard on the CV's but is going to be awesome for motorkhana and has ample wheel and tyre clearance on the insides. Kept the mirage bottom arms, rack ends, tie rods and hubs so nothing really changed there. Gave the donor engine a bit of a birthday. New iridium spark plugs, cambelt, waterpump, belts etc. First quad cam engine i've had to time up for the cambelt but not too hard. While i was there i carried out an aircon pump delete. Had to modify the tensioner to get more travel but will hopefully work ok.
Next up was the gearbox. Had to strip the old gearbox to steal the ralliart mechanical LSD out of it. Next i had to strip it down to rotate the internals around as the later gearbox spins the other way. 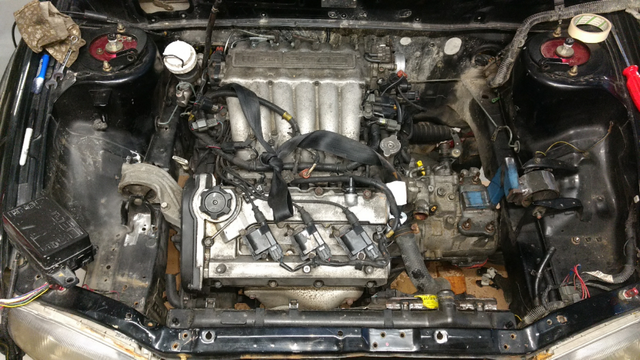 Then i stripped the Gen 2 mivec 1600 gearbox, installed the LSD, set the preloads and put it all back together. Had to get a little creative to get the FTO loom to work with the mirage lights and washer motors etc but having both wiring loom diagrams certainly eased the pain. Next up was the interior. I chose to fit the entire interior loom from the FTO to save headaches and also meant the dash etc would need to be swapped. Some cutting and swearing ensured however it doesn't look too out of place. Had to keep the mirage steering column which made it tight as the FTO dash protrudes further towards the driver. Ended up cutting about 100mm off the rear of the dash to get clearance. Swapped the fuel pump and sender from the FTO into the evo cradle in the mirage. Had to do some wiring changes but nothing too complicated to get FTO loom to work. While i was there i morphed the rear mirage loom into the FTO junction box by the B pillar so all electrics now working. It was about here when the plan went out the window and had to deal with a bunch of issues. Engine turned over but couldn't hear pump priming so started testing all the wiring and relays. 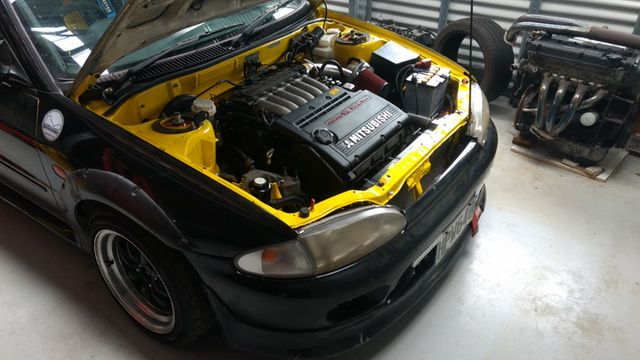 Finally worked out that factory ecu doesn't prime the fuel pump and just needed to turn the engine over for longer whoops! Engine fired up and PS fluid leaking from a crack in the cooling loop thing. Bypassed that and had it leak from one of the hoses. Sorted that and noticed fuel leaking from the fuel filter banjo. Fixed that and all seemed well. Ran it up on axle stands and went through the gears with no problems but noticed a vibration through the steering wheel. Dropped it down onto its wheels and drove out my driveway but soon realised something wrong. Back up on axle stands and sure enough axles too long and binding. Not bad with weight off wheels but terrible when turning and with weight on the wheels. I'd used the FTO axles as they are much stronger looking however were definitely longer than the CA4A ones. Realised that the original axles would work and just had to swap from left to right. Sure enough it now had play even when turning. Filled gearbox up with oil then noticed oil running onto the floor...the CA4A inner cv's have a smaller shoulder so the later axle seals were even touching hence oil pouring out. Back on stands and spun up the front wheels by hand and felt smooth. 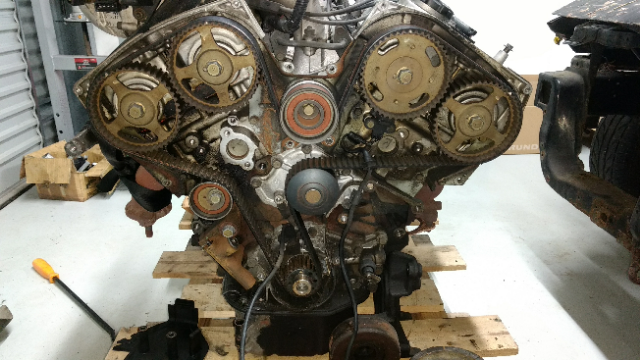 Out with the gearbox again and stripped it down for inspection, nothing out of the ordinary. Stripped the diff to check the plates etc and all is well. Decided to replace the diff bearings and the output bearing just to be safe. The input seemed very smooth. Put it all back together and refitted in the car. Removed the front brakes and with axles out spun up the front hubs...heaps of rumbling and play do'h! Looks like the longer axles stuffed the wheel bearings even only driving up my driveway. Luckily i had another mirage donor car so stole the front hubs off that and put everything back together...success! Car drove pretty good, not perfect but then again my alignment wasn't super accurate. Gearbox seems good especially after ditching the synchro wire on reverse which was causing the common reverse lock out issue. Was tempting to do the same on 1st but didn't want the gamble, it mostly goes into 1st without trouble so will see how it goes. Motorkhana requires 1st and reverse changes all the time so its fairly critical. The engine pulls nice and strong but is quite a bit louder than the 1600. Found myself changing up at 7500rpm as its screaming so will need to retrain the brain. It also sounds a lot like an RB as opposed to a V6 so might look at tweaking the exhaust so not quite so drony. 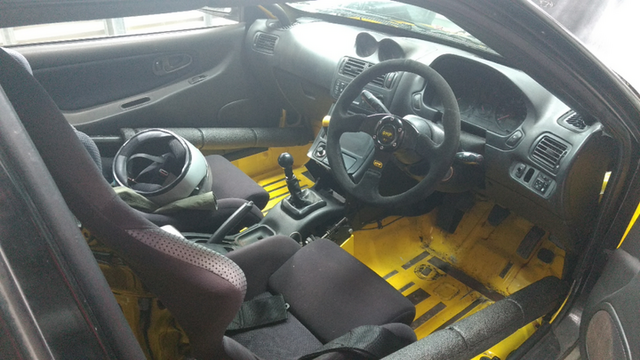 Interior almost done, have used the mirage center console and shifter surround and tried to morph with the FTO dash. Still a work in progress but not going to stop us racing this weekend. Fingers crossed it behaves and makes it through the day. Did you happen to weigh the engines to see how much heavier the V6 is? Problem was the 6a12 still had clutch and ps pump installed and the 4g92 had its alternator. Not really comparing true engine weights but i'm guessing the bigger engine is 40kg heavier give or take. Either way it feels much punchier especially in the midrange where you get caught off Mivec on corner exit etc. The gen 2 box is WAY better than the old gen 1 no longer dropping out of Mivec on the 1st to 2nd gear change. It ran very well in the sprint yesterday with no adverse handling characteristics. Motorkhana also went very well, seemed like better traction and certainly no downside from what i can see. Was it worth the 100+ hours of effort? Probably not but it sounds cool and ultimately is quite a bit faster so i'll soon forget about all the work!